One of the easiest ways to train your dog is to capture the behaviors you like. Capturing behaviors means waiting for your dog to perform a certain behavior, and offering a reward so it repeats the behavior. It won't work for everything you want to teach your dog, but you may be surprised at how quickly your dog learns to do new things when you use this clicker training technique. 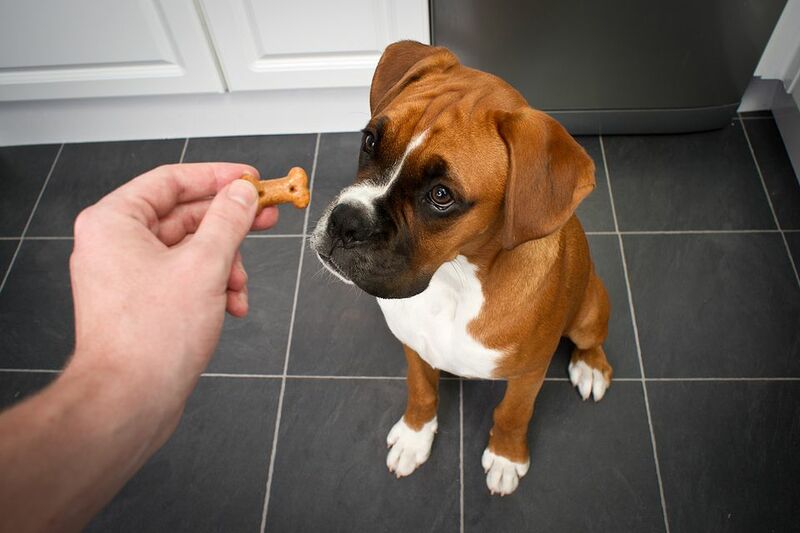 To capture your dog's behavior, all you need is a handful of small treats and a clicker. You can get a clicker at most pet supply stores, at big box stores or online. If you don't want to buy a special clicker, you can fashion one out of household items. As long as it makes a distinct, sharp sound that doesn't hurt your dog's hearing, you're good to go. It's important that your dog understands the meaning of the clicker (i.e. a click equals a treat). The more clicker-savvy the dog, the better this technique works, and the more behaviors you can teach this way. The treat must follow the "click" as soon as possible, so you don't confuse your dog. You may use other methods to train your dog along with clicker training, but if you're using the clicker, you have to give a treat or the technique won't be effective. The best thing about capturing behaviors is that you can do it anytime and anywhere, as long as you have your clicker and some treats on hand. You can even do it during commercial breaks while you watch television. The only rule to remember is that you should only work on capturing one behavior at a time. First, you need to decide which behavior you want to capture. It can be any behavior you would like your dog to perform, such as lying down, sitting, rolling over, etc. Then all you have to do is wait. As soon as you see your dog perform the behavior you want, click the clicker and give it a treat. If your dog is new to clicker training, or if you have not attempted to capture behaviors before, it will probably take it a little while to understand what you want it to do. Start with a simple behavior like "sit" or "down." You can work on more difficult behaviors once the dog is used to this training technique. Once most dogs get the hang of this type of clicker training, it becomes a fun game for them. If your dog is already an expert at clicker training, chances are it will catch on quickly. Once it hears the first click and gets its treat, the dog will start offering behaviors in an attempt to figure out what you want it to do. Soon after it figures it out, it will begin repeating the behavior you want fairly quickly. Once your dog has figured out the behavior you want it to perform and is consistently repeating it, it's time to add the verbal and/or hand signal command. Give the command for the behavior, and wait for your dog to do it. For instance, if you're trying to capture your dog sitting, tell it to "sit," and as soon as it sits, click and give a treat. You will know your dog understands the command when you see the time decrease between when you give the command and when it performs the behavior. While the clicker can be a fun game for many dogs, some dogs just never take to it. Either they don't make the connection between the behavior and the click, or the person training hasn't established the process clearly enough. For dogs that do get the hang of the clicker, sometimes it takes a bit longer process to shape the behavior, especially for more advanced actions. Most dogs get the knack of "sit" and "stay" fairly readily, but "roll over" might not be as obvious. Shaping the behavior, rather than just capturing it, means breaking it into a process with steps. You can use the clicker and treat at each step.